Description: The flowers are in radiating clusters at the stem tips. 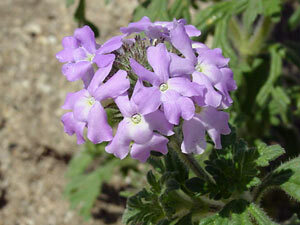 The individual flowers are tubular with 5 notched lobes. The leaves have rolled under margins and are dark green, deeply-veined, opposite, stiffly-haired, and although variable in shape, they are usually deeply bipinnately dissected (bipinnatifid) and almost as wide as long. The stems are hairy. 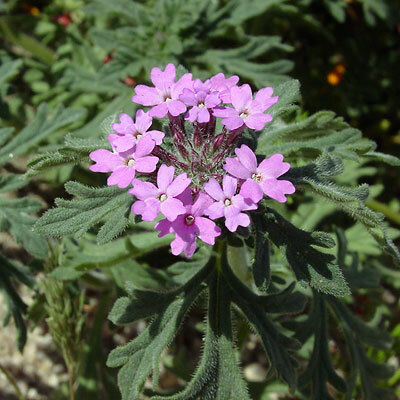 The similar Southwestern Mock Vervain (Glandularia gooddingii) does not have bipinnately dissected leaves. Fragrant – The flowers are lightly fragrant.